The HUB is a wearable Mini Base that expands the capacity of UltraLITE wireless headsets TO SEVEN USERS.. The compact transceiver weighs only 9 oz. and can either be placed strategically "on location" or belt worn. When clipped comfortably to the user's waist the HUB moves seamlessly with the group allowing UltraLITE headsets to remain connected in full duplex. 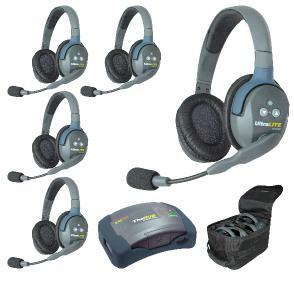 The HUB can be used as the seventh full duplex transceiver with the addition of an Eartec plug-in headset. See options below. 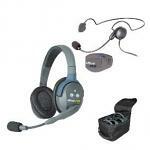 Choose from various options of single/double headsets and parts in the selection list. Sizes for apparel & shoes are Mens unless noted in the description or product name. PLEASE DOUBLE CHECK YOUR SIZE/COLOR/OPTION AFTER ADDING TO YOUR CART! Our website uses a pop-up to notify you if a size or selection is out of stock, pelase enable pop-ups in your browser for our site. Only registered customers are allowed to add reviews. Please sign in and add your own review! 310-872-6521 - Retail Hours ONLY! Items are not stocked in SLO, call for info.